Time and again the lists of new CD-releases contain names of Italian composers most people have never have heard of. To some extent this reflects the fact that Italian music history, in particular of the decades around 1700, hasn't been fully explored yet. But it also shows the large demand for music in Italy, where princes and dukes, cardinals and bishops wanted to demonstrate their power and status by attracting the best musicians and composers available. And since music was a part of everyday life, like food and drink, there were plenty of opportunities for performers and composers to make a living. Gaffi was born in Rome and spent his whole life in the city. He was educated as a keyboard player by Bernardo Pasquini, the leading keyboard virtuoso in Rome in the second half of the 17th century. He became organist at several of Rome's churches during his life, the most important of which were those previously held by Pasquini. Performances of vocal music were an important feature of musical life at the courts in Rome. Gaffi took part in a number of them as a harpsichordist, among others those organised by Cardinal Pamphili and Cardinal Ottoboni. He also became connected to Prince Francesco Maria Ruspoli, who commissioned three mass settings, and to whom Gaffi dedicated his only opus which was published during his life: a set of chamber cantatas, which was another genre which was in huge demand in those days. In these cantatas he showed himself an original composer by giving the harpsichord a concertante role. 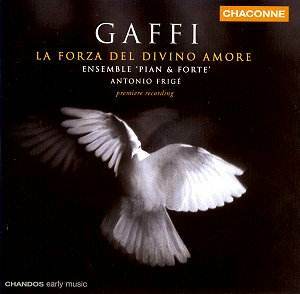 Gaffi composed eight oratorios - most of them in the last decade of the 17th century - which were not only performed in Rome, but also in Florence, Venice and Vienna. One of these is the one recorded here, which is about the life of a saint: St Teresa of Avila (1515 - 1582), the Carmelite mystic who founded a number of convents and monasteries in Spain. In this oratorio the allegorical figure of Divine Love calls men and women to take up arms and suffer and die for Jesus. Teresa wants to answer to that call, and her younger brother Rodrigo is ready to join her. In the second part they renounce all earthly pleasures and prepare to follow Divine Love's call. But she then asks them to return home, as they have already proven their faith. Teresa obeys, as it is the will of Heaven that she becomes a messenger of Divine Love and brings glory to the Carmelite Order. The oratorio ends with the line: "For the glory of the Carmelites, the honour of heaven." This is very likely the first recording of any work by Gaffi. Is it worth the effort? That depends on what one expects. There was an enormous need for music during the 17th and 18th centuries. Originality wasn't the main demand, and music certainly wasn't written for eternity. For simple statistical reasons one cannot expect every single work from that era to be a masterpiece. And I think this oratorio isn't either. I find it somewhat uneven in quality. There are some very fine arias, with a lot of text expression, like St Teresa's arias "Che posso dir io" and "Deh pietà, Signor mercé", both in the second part. And her aria "Piacere terreni" is the highlight of the first part of the oratorio, in which the violins illustrate her exclamation "Piaceri terreni ... partite fuggite" (earthly pleasures ... go, fly). Earlier in the oratorio the trumpet is used in some arias with a martial character, in particular, of course, in Divine Love's aria "Già suona la tromba" (The trumpet is sounding). But in some arias and recitatives possibilities to express the text in the music pass by unnoticed. As the quality of the oratorio is uneven, so is the performance. The ensemble is fine, and I have nothing but praise for the way Gabriele Cassone is playing the trumpet part, even though I suspect his instrument is 'fixed' in order to play in tune. Of the three vocal roles that of St Teresa is the most interesting and musically demanding, and it is impressively performed by Marivì Blasco. She has got a beautiful and flexible voice, which is excellently suited to this role. The Czech soprano Leona Peleskova has a somewhat darker and lower voice. I would rather label her a mezzo-soprano. It is perhaps due to the fact that she isn't a native Italian speaker that her performance is a little stiff, in particular in the recitatives. Her diction isn't flawless either. Sergio Foresti doesn't have any problems in this regard, but in his attempts to sing expressively he tends to exaggerate sometimes, with a hint of sentimentality. He is at his best in his duets with Marivì Blasco, where both voices blend quite well. To sum up, this recording is hardly a 'must', but there is enough to enjoy in order to recommend it to those interested in the Italian vocal music around 1700, which until recently was so grossly neglected by musicians and record companies alike. A disc like this reminds us that thankfully a lot has changed in this respect.